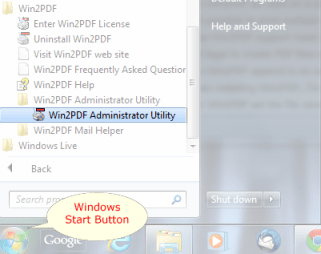 The Win2PDF Admin Utility is a free download used for managing Win2PDF settings, disabling Win2PDF features, setting defaults for all users, setting automatic email and file save features, and troubleshooting. To download this software, visit the Win2PDF Admin Utility page in our technical support section. Once you have downloaded this file, double-click the setup file to install. "Start->Programs->Win2PDF->Win2PDF Admin Utility->Win2PDF Admin Utility"